Blackpool’s tourism hopes have once again been derailed by new track disruption announced over the key Easter and May bank holiday periods. Network Rail has said essential maintenance will be carried out on the West Coast Main Line and are warning bank holiday travellers of delays. Blackpool’s hoteliers say they are “mortified” by the news and Blackpool South MP Gordon Marsden has written to Network Rail to demand they give full details to passengers of how they can get to the resort. And a programme of works is scheduled up and down the line including works in Lancashire which could also impact on journeys to and from the Fylde coast. The Euston work is in preparation for HS2, Britain’s new high-speed railway, and includes work to clear additional concourse space to help customers move more freely around the station. But it means anyone from London or the South East who has booked a stay in Blackpool will have to travel via Leeds or to Birmingham and change stations there before travelling on to Lancashire. On the tracks in Lancashire, bridge renovation and strengthening will be carried out at Coppull Moor Lane, in Chorley. Railway track will be replaced at Golborne, Coppull Hall, in Chorley, and Blainscough. Track foundation improvements and work to overhead electric lines will be carried out at Carnforth and there will be track foundation improvements at Upperby in Carlisle, which will disrupt journeys between Blackpool and Scotland, another important source of visitors for the resort. Bus replacements will be in operation in the area. Claire Smith, president of Stay Blackpool, the hoteliers association, said given last year’s disruption on the railways at key tourism times due to the electrification and upgrading of the line, it was the last thing they wanted to hear. She said: “Even just the discussion of rail inconvenience leads people to decide not to bother and to go somewhere else that is much easier to get to. “No one wants to be stuck when travelling. “This announcement is mortifying to business people. The trains have been a complete disaster for us and we are completely fed up with the whole thing. Blackpool South MP Gordon Marsden said he had been contacted by Network Rail about Euston being closed and the West Coast line being disrupted but was angry about a lack of real detail and any alternative route advice for people travelling to Blackpool. He said he had written to Network Rail to express his dissatisfaction and demand clarity for travellers. He said: “Following the widespread disruption last year for the so-called improvements, I was assured would never happen again, but it has. It is disgraceful. “They do not seemed to have learned anything from last year despite the widespread damage to Blackpool’s economy and disruption it caused. “Accepting that Euston has to be closed, why are they not clearly offering advice and alternative routes for people wanting to get to Blackpool? Blackpool North and Cleveleys MP Paul Maynard said: “I do understand that essential engineering works need to take place and at a time that has least effect on the time table, so I understand why Network Rail chooses the Easter weekend for these works. 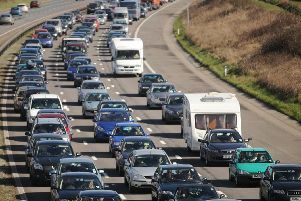 Network Rail advises best days for travel over Easter will be Best days to travel: Thursday, April 18 and Tuesday, April 23. Some of the work carried out at Easter will need to be continued between Saturday, May 4 and Monday, May 6 with the advice to travel on Thursday, May 3 and Tuesday, May 7. “Bank holidays are the least disruptive time to do it, when fewer passengers use the railway compared to the working week. “That way we can do the maximum amount of work while impacting the fewest number of people. “Train companies and Network Rail have worked together to minimise disruption for customers. This is the second year running that traders are having to contend with rail delays over the Easter weekend. Last year, Network Rail blamed bad weather and technical problems for holding up work on the Blackpool North line, which meant no trains in or out of the station during the key bank holiday weekend. While this year will not be as bad, there was widespread anger as prolonged chaos on the railway was cited as having dented last year’s visitor numbers. The Easter setback was followed by timetable problems that led to huge numbers of delays and cancellations, as well as a series of ill-timed strikes. And it saw visitor numbers between May and August last year fall by 400,000 – with the train troubles among the key culprits, according to tourism chiefs. Now the news of further disruption on a traditionally busy weekend this year has been labelled “disappointing” by traders hoping the problems had been put behind them.